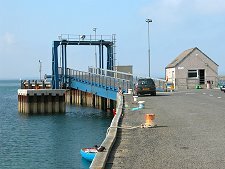 Whitehall is Stronsay's main village and the terminus for the ferry service from Kirkwall. Its focus is its main street, which faces out into Papa Sound from between the arms of its two piers. Whitehall is notable mostly for the impressively substantial nature of most of its properties, which hints of considerable past wealth. Despite this hint, it is difficult to imagine Whitehall as it would have looked each July and August during the height of the herring boom from the 1880s to the First World War. 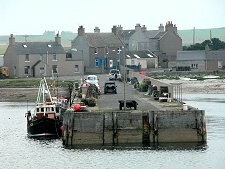 For some six weeks the population of Stronsay, normally around 1,200 at the time, would rise to over 5,000 as fishing fleets, fish gutters and others descended on what at the time was by far Orkney's most important fishing port. 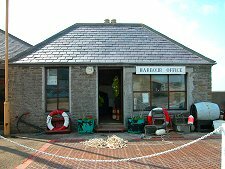 Today's population and visitors support the small Stronsay Hotel, Ebenezer's Stores, a Post Office, and the cafe at the Fish Mart. But during the boom Whitehall boasted 15 fish curing stations; 10 general merchants' shops; three bakeries; five butchers; five ice cream parlours; assorted cafes and fish and chip shops; a cinema; and no fewer than 40 pubs. 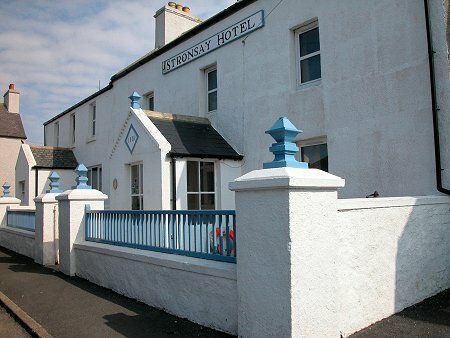 And the Stronsay Hotel of the day laid claim to the longest bar in Scotland north of Inverness. Perhaps understandably, the village was also home to a police station. But herring catches started to decline in the 1920s, and in 1937 the fish arrived in Orkney on their annual migration six weeks late, after the fishermen needed to catch them and the processors required to gut and salt them had already moved south to eastern Scotland and England. 1939 saw another disaster for the fishery and, perhaps as a symbolic mark of the end of an era, the Stronsay Hotel burned down in the same year. 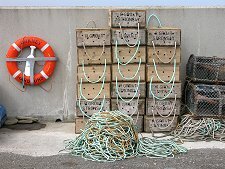 The herring boom was over. Only a little of the subsequent decline shows on the face of Whitehall itself, but not far to its east the ruins of a nearly empty Lower Whitehall are clear evidence of the much greater extent of the village during the herring years. 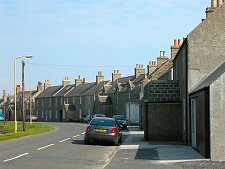 It is also a clear sign of Stronsay's falling population. As late as 1931 this stood at nearly 1,000, but it had fallen to under 400 by 1991, and to 349 in 2011. 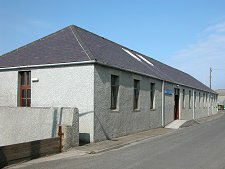 Much of the story of the herring boom and its impact on Stronsay and on Whitehall is told extremely well in the Fish Mart, once the heart of the industry on the island and now a cafe and a hostel. 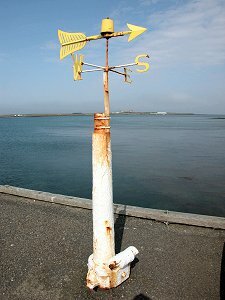 Unsurprisingly for the main village overlooking the best harbour on an island named by one seafaring people (the Vikings) and then settled by another (the Dutch), Whitehall has always had close links with the sea. It takes its own very English-sounding name from the (presumably white) house built here by the privateer, Patrick Fea, in 1672. A privateer was the polite name for a pirate who gained some official sanction from one or other government in a conflict so long as he only preyed on ships of the other side. Patrick Fea made his fortune from his activities during the Dutch wars of the 1600s in which the Dutch were less than gently dissuaded from pressing their interests in the fisheries of Shetland and Orkney. One thing Whitehall can no longer offer visitors is the longest bar in Scotland north of Inverness. 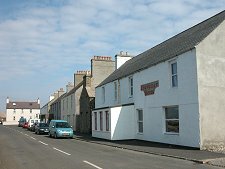 When the Stronsay Hotel burned down in 1939 it was replace by the much more modest establishment illustrated in the header photo: one better suited to the needs of the day in a converted house on the main street opposite the Fish Mart.